University Library Dean Vicki Williamson. 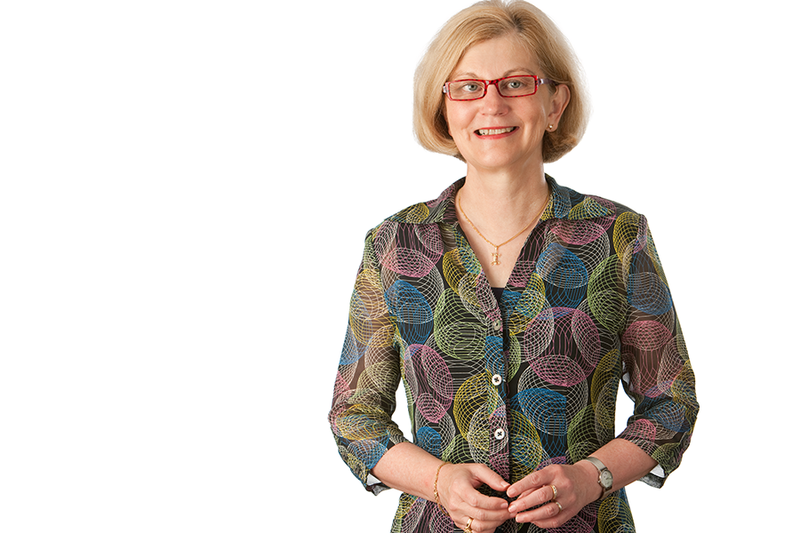 After 10 years at the helm, Vicki Williamson is stepping down as the dean of the University Library. As the first dean, Williamson oversaw a period of immense change. As she prepared to head off on administrative leave, she sat down with news editor Kris Foster to talk about her time at the U of S.
OCN: During your tenure, the University Library underwent significant changes. What stands out? VW: Not only has the library changed, but the world that libraries live in has changed enormously. When you think about the way information is now published, how we use technology and how technology allows us to have almost instant access to information, that context has changed enormously. We've seen tremendous changes in our collections, facilities and services we provide. We have also experienced enormous change in organizational culture in terms of who we are as a library. If you think about collections over that 10-year period, we transitioned from a high dependence on print resources to the world of electronic information that needs reliable, credible, quality information 24-7. Available seamlessly. You don't have to come to the library to access it; you can be in your favourite pair of sweatpants sitting at home accessing the collection. OCN: Can you talk about how services had to change to match that shift? VW: Absolutely. When you think about services, there has been incredible change in that area. Library employees used to mediate services. So, if you wanted to borrow a book, the library had to be open, the book had to be on a shelf, you had to stand in line at the circulation desk and then have someone mediate the service for you. Now it is self-serve. That shift away from mediation to self-service has been huge. Everyone said that the world of electronic information would make libraries redundant. But our visitor numbers have grown immensely, particularly from the changes at Murray and the Veterinary Medicine libraries and the opening of the Leslie and Irene Dubé Health Sciences Library. People often say to me that maybe the numbers are up at Murray because people are just coming for the Starbucks. But we know that, while they certainly do come for Starbucks, they come for other things too; they come for the sorts of new services that are available, the information and knowledge management expertise of our library faculty and staff. They come for our learning programs. We have seen over those 10 years the integration of student learning services. They come for the peer mentorship program and information literacy. They come for a variety of reasons but they still come to that physical space that used to be really about custodial services for print resources. OCN: Everyone saw this wave of change coming, but how did you brace and prepare for this massive adjustment? VW: I think first and foremost, no one person could do this on their own. I'm proud that we have put a lot of effort and energy in creating a workplace culture that library employees, regard- less of where they work, regard- less which location they work, service they deliver, functional specialization they have, that they first and foremost identify with the University Library and the contributions we can make by operating as an integrated library system. We have invested heavily in employee learning and development. The concept of ‘leadership from where you stand' is now heavily embedded in our organizational culture. Our programs have featured transforming our workforce from the print to the electronic world so that everyone is comfortable and has the knowledge and skills and competencies to function in that complex world. We've embraced technology to help us do our work smarter, easier and quicker. We've focused on reengineering some of our very complex library land processes and generally we've embraced change and recognize that we have to take a strategic view of who we are, and more importantly what we do and why we are critical and committed to making a difference at the U of S.
There has also been a massive shift in who we are as a University Library. In particular, I am very proud of our level of employee engagement and the way we have come out of our shell and partnered with other colleges and programs on campus to really make a difference. The university community understands the knowledge, skills, experience that librarians can bring to the research activities of the university from enhancing the student experience to having a real impact of the core mission of the university around teaching and learning and knowledge creation. OCN: You talked about how libraries influence teaching and research, but how do they enhance the student experience? VW: When I first arrived here, a person told me a library couldn't fundraise because it didn't have graduates or alumni. It really shocked me and the response I made on that occasion, and continue to make, was that nobody graduates from the U of S without a library experience. I wanted to make sure that experience is always positive, that it is always helpful, and that it's empowering for students to learn the value of being able to access information for them- selves. That can help them make evidence-based choices about careers, disciplines and life. It is a powerful thing and it has kept me in the world of libraries for most of my career. OCN: Looking back, is there anything you would have done differently? VW: After a decade there is pause and reflection, but I don't think I would've done anything different. That's not to say others don't think I should've done things differently. I've always tried to take account of the evidence, and rely on my professional knowledge and expertise. I've tried to be innovative and I took some risks. But more importantly, I always tried to make decisions within the context of time and in the best interest of the library and the university. That context leaves me with an impression that I am happy with the way things turned out. So I leave with absolutely no regrets; I leave the office with pride in all we've been able to achieve. I leave a team that has trust, leadership capacity and capability. I have comfort knowing I can continue being a strong ambassador of the university and I'm excited to help spread the word about Saskatchewan, Saskatoon and the university. What a well-kept secret we have in this institution; we are making an impact around the world and the world needs to hear that story. OCN: So, what are your plans now? VW: (laughing) Undecided. I'm embarking on change, I think there is always a time for a leader to leave, the team is ready, now is the right time. During my administrative leave I am doing some work on internationalization strategy. At the moment I'm focused on a big change; 10 years ago I was transformed from the southern hemisphere to the northern hemisphere. After 10 years I am returning to Australia—this time with dual Canadian and Australian citizenships. I have to reorient myself there and I am preparing to transition to a more mellow pace. Closer to the end of my leave, I will start having conversations on how I can, as a faculty member, continue to make a contribution to the U of S … or not as the case may be. It's been a remarkable journey, fabulous learning opportunity that exceeded my expectations. I learned a lot and I am very grateful for all of the experiences and memories. I've found it to be a wonderful experience.